One of the things we’re thankful for this year is being able to offer our patients a variety of ways to get rid of their double chin. After all, the “gobble, gobble” looks best on turkeys. Whether you are looking for non-invasive options that show improvements over time or prefer to surgically define your jawline, we can help you choose the ideal method during your consultation. 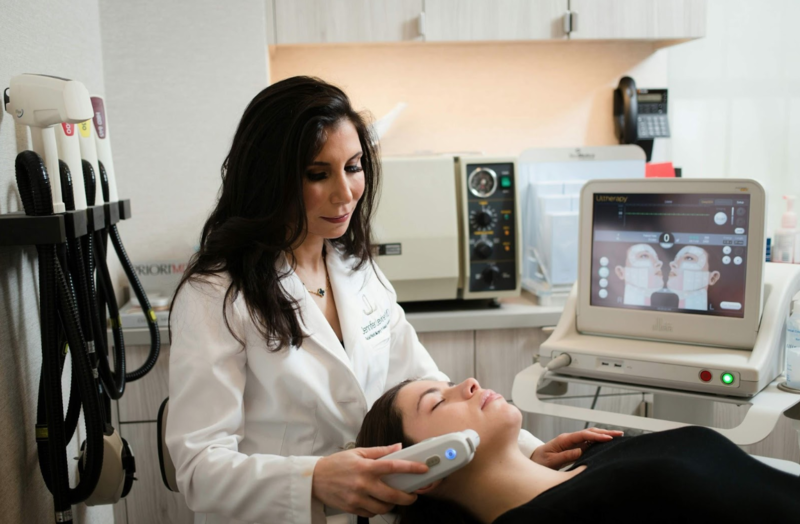 A consultation with Dr. Jennifer Levine is a collaboration between you and a facial expert, where you get to discuss your aesthetic goals and make a customized plan to achieve them. 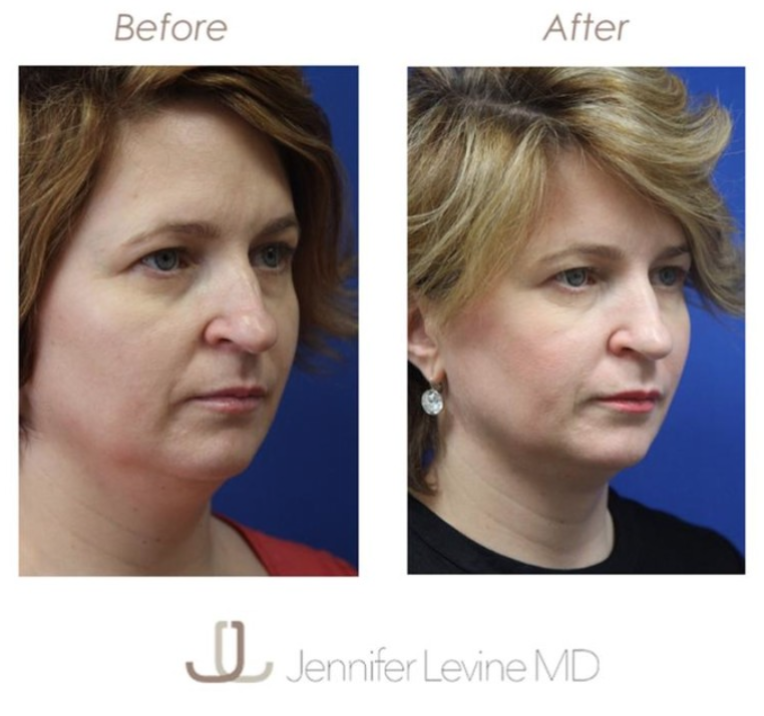 During your consultation, Dr. Levine will observe your facial structure as well as your skin laxity to determine the best treatment or procedure for you. You can schedule a consultation with Dr. Levine by calling 212.517.9400. Ideal for women and men with good skin elasticity, neck liposuction surgically removes fat isolated in the submental (double chin) area. It is an outpatient procedure, which can be completed from the comfort of our office with twilight anesthesia. Recovery takes approximately two weeks. KYBELLA® is the first and only deoxycholic acid injection that is used to reduce submental fullness, or “double chin”, in adults. Deoxycholic acid destroys fat cells permanently but can take several treatments for optimal results. As is apparent in the before and after below, subtle changes such as the reduction of the double chin can produce significant results. A patient favorite, our body sculpting equipment is FDA-approved to reduce submental fat (double chin). Both, SculpSure and Coolsculpting, take approximately 30 minutes per treatment to reduce about 24% of body fat in the treated area. To see specifics for each treatment, please click here. Ultherapy is another non-invasive treatment that uses microfocused ultrasound technology to tighten loose skin over time. While it does not destroy fat cells like the treatments above, it can help tighten skin and reduce the appearance of wrinkles in the area, creating results that look natural. This helps create a more defined and rejuvenated appearance of the neck and jawline areas. Ultherapy, used and loved by the beautiful Christy Brinkley, is ideal for men and women who have mild to medium skin laxity. Like Ultherapy, this treatment does not destroy fat cells, but aids in producing results that look natural. It helps rejuvenate and smooth skin, which gives a rejuvenated appearance. Frax1550 is a non-ablative laser, which means that it does not break the skin. As a result, the treatment is more comfortable, and the recovery is faster. Questions? Give us a call at 212.517.9400.